899 pages | 654 B/W Illus. Carefully structured to instill practical knowledge of fundamental issues, Optical Fiber Communication Systems with MATLAB® and Simulink® Models describes the modeling of optically amplified fiber communications systems using MATLAB® and Simulink®. This lecture-based book focuses on concepts and interpretation, mathematical procedures, and engineering applications, shedding light on device behavior and dynamics through computer modeling. 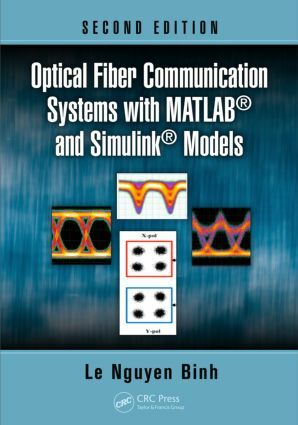 Optical Fiber Communication Systems with MATLAB® and Simulink® Models, Second Edition is intended for use in university and professional training courses in the specialized field of optical communications. This text should also appeal to students of engineering and science who have already taken courses in electromagnetic theory, signal processing, and digital communications, as well as to optical engineers, designers, and practitioners in industry. "This book describes the principles, practices and modeling of optically amplified fiber communications systems using MATLAB® and Simulink® platforms. This lecture-based book is pleasant and contains careful discussions of a large number of topics dealing with the multifaceted aspects of light-wave optical-fiber communications engineering. Binh does an excellent job of focusing on practical applications and fundamental issues. What sets the book apart from other optical fiber texts is the author’s framing in terms of MATLAB Simulink models. The target audience for Binh’s book includes undergraduate engineering and science students, as well as optical engineers and designers." "This book adds an aspect of programming and simulation not so well developed in other books. It is complete in this sense and enables directly linking the physics of optical components and systems to realistic results." "…this will be an excellent textbook since it has all new development and information on optical communication systems…I think this book can easily replace many other textbooks in this field." "The book is well written. It describes the fundamentals of fiber optic systems and presents the exact model texts and mathematical formulas which can be used to create practical computing models." Le Nguyen Binh is a technical director at the European Research Center of Huawei Technologies Co., Ltd. in Munich, Germany. He is the editor, author, and/or coauthor of numerous books, as well as the editor of CRC Press’ Optics and Photonics series.